Megan and Joe first met when they were both working at Sherwin Williams. They worked in different stores but interacted with one another quite frequently. Eventually as time passed, they started dating and here we are, they are engaged. Their proposal story is quite awesome. They went to a park in Rocky River, Ohio, where they have spent much time hanging out. They sat down on a bench to look over Lake Erie around sunset and he asked her to marry him. As he proposed, there was (an unplanned) group of teenage girls "ewwing" and "ahhing", which made for a funny ending to their proposal story. Their engagement session was so much fun because they are such a fun couple to be around. They are constantly laughing and it is easy to see how much they truly love one another. 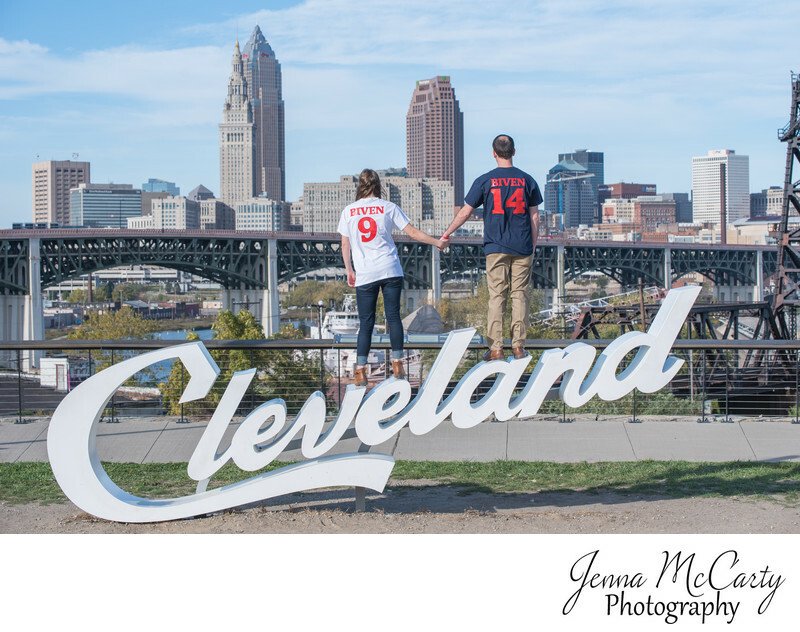 For their engagement session, we headed to two locations, Edgewater Park in Cleveland and one of the famous Cleveland signs near Ohio City, Ohio. They will be married on September 14th, 2018 and their reception will take place at Windows in the Water in Cleveland, Ohio. I look forward to capturing the next chapter in their love story. This photo features the couple standing on one of the famous Cleveland signs in Cleveland, Ohio.